I’ve used the impassioned scare tactic in my climate crisis epiphany post, but most people just want to know if environmentalism will save them money. Conservation isn’t a new idea and it’s getting harder and harder to be a skeptic about the damage we’re doing to Earth these days. If you’re not convinced, there are still hundreds of ways to save money (and save the environment at the same time). Here are five (after the jump). Do an energy audit. 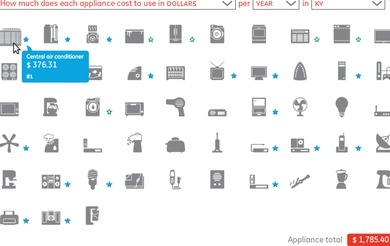 The U.S. Department of Energy has a Home Energy Saver (and tips on getting tax credits) or just take a glance at GE’s handy Home Appliance Energy Use page. I’ve already mentioned using a quick emissions calculator, as well. The next two tips are examples of saving hot water, one of the highest energy costs. Don’t run the shower the whole time. Never use hot water in your washing machine. Your clothes stay just as clean. P.S. Thanks to Amber Hurdle for the idea to do another post about practical conservation. She’s on my blogroll.